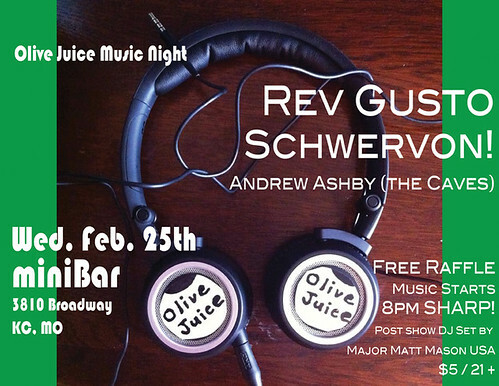 Olive Juice Music Night comes to miniBar Wed. February 25 w/ Rev Gusto, Schwervon!, Andrew Ashby (The Caves) + Free Raffle for $25 gift card for The Vinyl Underground @ 7th Heaven | Schwervon! Enter a FREE raffle to win a Grab Bag of Musical Treats including a $25 gift certificate for The Vinyl Underground! Plus after hours DJing by Major Matt Mason USA. All this fun for just $5 (21+) Music starts at 8pm SHARP! This entry was posted in Uncategorized and tagged Andrew Ashby, KC Music, minibar, Music Night, Olive Juice Music, Rev Gusto, schwervon live, Vinyl Undergound. Bookmark the permalink.